You can now download e-Admit Card of Joint Entrance Examination (JEE) (Main) 2018 through the website https://jeemain.nic.in. Examination (JEE) (Main) 2018 (Pen & Paper mode) on Sunday, 8th April 2018. Computer based examination of Paper I of JEE (Main) will be conducted on 15th & 16th April 2018. 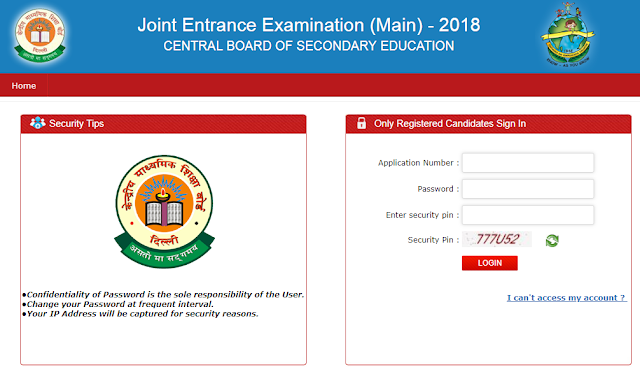 How to Download JEE (Main) 2018 Admit Card? Enter the Application Number, Password, Security Pin and click on Login. If any applicant is not able to download his / her e-Admit card, he / she may contact CBSE Helpline Number: 7042399520, 7042399521, 7042399525 or 7042399526, (10 AM to 5.30 PM) on working days.